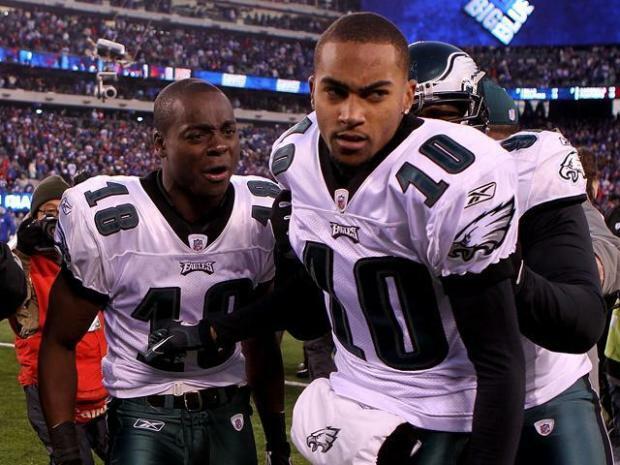 After Sunday's dominating fourth quarter comeback against the Giants, the Eagles no longer have a choice: they have to extend the contracts of Michael Vick and DeSean Jackson -- as soon as possible. Would they be assuming some major risk with those moves? Absolutely. Jackson probably isn't close to his listed 175 pounds in pads and has a history of concussions and neck injuries. Vick is a 30-year-old scrambling quarterback, takes a bunch of hits, and hasn't shown that he can play at this level long term. Plus, he's one off-the-field misstep away from permanent suspension by the NFL. No other two players in the NFL could have won Sunday's game. Substitute Tom Brady, Drew Brees, or Peyton Manning for Vick -- and they don't escape the Giants blitzes for 30 yard runs, put the team on their back and carry the Eagles to victory. Substitute Terrell Owens, Andre Johnson, Larry Fitzgerald for Jackson -- none of them could have executed that that dramatic last-second return which truly made the game the "Miracle at the New Meadowlands" that it was. Eagles fans already know it's time, tweeting about DeSean-inspired T-shirts with the slogan, "Show Him the Money", a catchphrase that ought to apply to both players. It's time for the Eagles organization to recognize it as well. Vai Sikahema, John Clark and Howard Eskin debate whether the Eagles stunning win over the Giants on December 19, 2010 is the most important Miracle in the Meadowlands.